Taken with Olympus E500 digital camera January 31st 2008. Click image for larger view. I love massive cloud formations and today there were some really nice ones here in Northern Norway. It was snowing a little when I took this picture so it was nice to see the sun shine brightly on the clouds. 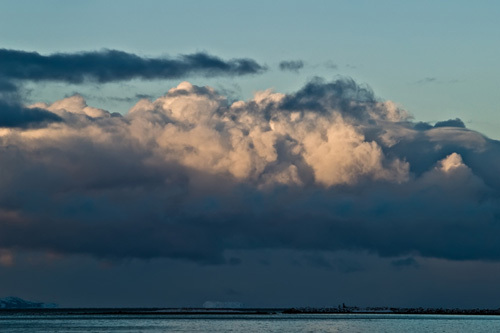 Check out this photo of cloud formations and midnight sun. Those are some serious clouds. I’ve seen less dense mountains. Your pictures are beautiful! Thank you for sharing them! I can sense from pictures the temp usually. It seems very cold from that one. Nice clouds. I saw that you stopped by on StumbleUpon and visited me (http://plaintalk.stumbleupon.com). I’ve added you as a friend. I checked out your site and love your pictures. I have never been to Norway but from the pictures you have posted, it’s absolutely beautiful.